I left Telford Buddhist Priory at 9.00 am yesterday and arrived at Throssel around 4.00 pm. That’s travelling by car then train and car again. This morning I felt like I was under a train, at least! The impact of covering distances at speed, even slow speed in yesterdays case, cannot be ignored any longer. Perhaps there has always been this pain, this road/rail lag as I think of it. Now with a few extra years on the clock, and hopefully less of a tendency to bash on, I’m giving myself permission to stay with it. That’s to stay with the basic pain and allow all systems to re-calibrate, which happens in due time and with adequate rest. All the same, and in spite of the pain, it is good to be out and about. In Germany a lay woman asked a question at a gathering about a certain consciousness of being around monks and her noting the difference. She was wondering aloud if one was ‘better’ than another, while at the same time knowing in her gut that there wasn’t. This is a conundrum that frequently befalls the seriously minded, lay and monastic. There’s many ways to answer but all I could come up with was that most of the time I don’t have an awareness of being a monk. Also I don’t think, ‘I’m now talking to a lay practitioner’, or a monk. The contact is more direct than that. What ever exactly I said it seemed to strike home. There is a difference in appearance of course. 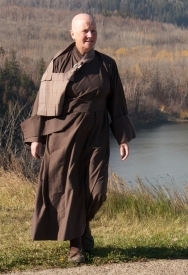 Robes and a shaved head are still how a monk appears in the world. However there is something deeper than how any of us appear. Yesterday I travelled in what we call town clothes. We do that when it seems wise to be incognito. From Manchester to Carlisle the carriage, the quite coach in fact, became markedly rowdy. Then at Preston the P.A. announced, due to staff shortages, that the buffet car was now closed. The flow of beer slowed, the mood took a decided dip and turned a bit nasty as well. At times like this I’m glad of trousers, tops, hat and coat to sit inside of. Just 24 hours later and I’m sensing that systems are close to being back to normal and my ability to string words together is returning, somewhat. A kind monk had left a welcoming card in my room. Welcome back home Rev. Master Mugo, All is well here. Yes, all is very well here, within and without. Great story. I’m glad you got back in one piece. Carlisle beat Leeds 3-1 to go top of League One, and 21 were arrested. I’ve had a similar experience, in that despite all the demonstrations I used to go on, the closest I ever came to a police horse was on the way back to the tube from an Arsenal match. Quite scary. Thanks Dave. I’d thought to ask if somebody could find the results of the match. But not imagined we’d get the arrest results too! Thanks. Since I am very familiar with horses being up close was not a problem this time. But if they were being used for crowd control I’d get out of the way fast. They can do damage. Bless em. I came close to a horse’s whiskers once, strangely enough at Elland Road where Leeds United play. I was trying to walk away from the ground after a match, looked up & an enormous police horse was bearing down on me. I had to jump out of the way. That & being stopped from walking up Briggate, a main street in Leeds, because I was wearing a Leeds scarf put me off going to matches any more. I did get fairly close to horses at demonstrations though. They always seemed incredibly large. Unruly crowds of frenzied fans — my experience was not with soccer but with Beatles & Rolling Stones. Ah, youth. I’m so glad you made it home safely. We all have a few stories to tell! The wonder of it is that we are still alive to tell them. Right? I had a similar encounter however mine was with a full grown bull Moose upon rounding the corner of a cabin and coming eyes to nostril with it… a rapid shot of adrenaline to the heart and I made my best time ever covering the few 100 metres to the main lodge.